Special Containment Procedures: SCP-980 is to be kept in a 3 m x 3 m x 5 m lead room suspended in the center of a 25 m x 25 m x 25 m containment area at Site-██. This room is to have a single glass window aligned with the window to the containment area. The inner window requires replacement every 8 days. Leaded glass is to be used instead—see addendum. The door to this room is to be kept locked at all times that SCP-980 is not under study. Personnel ranking above D-class are not to enter the surrounding containment area due to mental and physical danger. No armed personnel or guards are required near the lift to SCP-980's cell, as it has not shown any means of escaping. In addition, the fall from its containment cell would injure it enough to prevent escape. No feeding or nutrition of any sort is necessary. Description: SCP-980 is a featureless humanoid of average height and weight, indeterminate age and gender, and smooth gray-white skin. SCP-980 does not possess any facial characteristics, sensory organs, or features such as nails and hair. It is injured with relative ease, bleeding a viscous substance that appears similar to white paint. Analysis shows that SCP-980 possesses no internal organs, though it does have a skeletal structure comparable to that of a human. Despite the absence of eyes and ears, SCP-980 appears to display 20/20 vision and slightly above-average hearing. Extensive testing has not explained this, though no abnormalities or anything to suggest other methods of sensory capability have been shown. SCP-980 is able to write in English when prompted, though typing is inefficient due to its influence quickly rendering the keys as well as the monitor unresponsive. SCP-980 naturally inflicts a "simplification effect" on objects and beings within a sphere 8 meters in radius around it. Said effect streamlines the features of objects while removing color, detail, and often function. Animals first lose fur and distinguishing characteristics such as length of limbs and tails, presence of protuberances, etc., while humans develop more average facial features and lose or gain height and weight. This edges towards a rough "average" of around 1.7 meters tall with a weight of 76 kilograms. This is shortly followed by losing facets of their personality, with interests, habits, and memories commonly lost first. While brief exposure to SCP-980 is not physically harmful, prolonged exposure of organic beings with complex circulatory and respiratory systems commonly results in the "simplification" and fusion of parts located near one another. No subjects have reported pain from the process itself. A D-class personnel used to test SCP-980's effects was affected on this level after approximately thirty minutes within SCP-980's containment area, with heart failure occurring almost immediately afterward. Autopsy showed that the chambers of the subject's heart had been fused together. Physical results tend to be somewhat random, usually affecting the heart, lungs, arteries, stomach and intestines, the brain, and the sensory organs. While some cases are not fatal or even harmful in the case of the sensory organs, further exposure to SCP-980 causes transformations at a rapid pace. 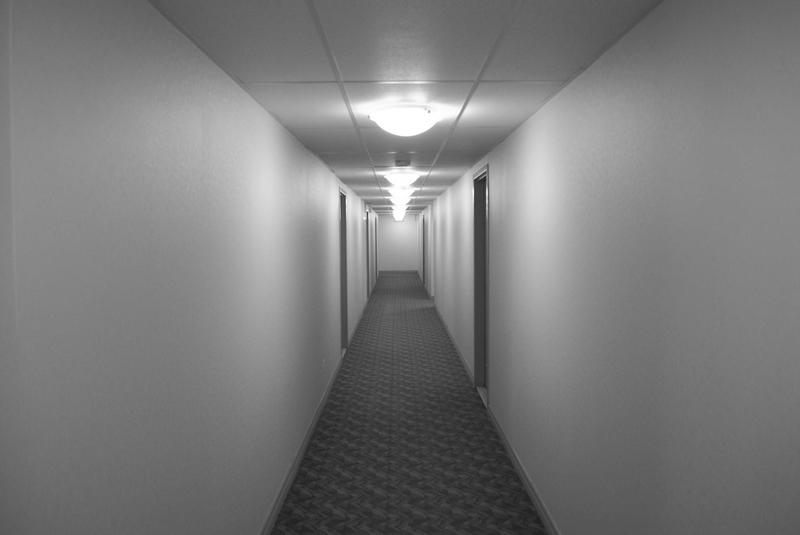 One of many simplified hallways at the █████ █████ apartment complex. SCP-980 was found at the █████ █████ apartment complex in ████████, ██, after several hours of exposure to SCP-980 caused deaths and mental harm to nearby civilians as well as color and shape simplification to said apartment complex and many objects inside. At the time of acquisition, it was wearing heavy winter clothing and a hood. SCP-980 has not responded thus far to inquiries as to how it came to be, though room 307 seemed to have been affected more than other nearby locations. 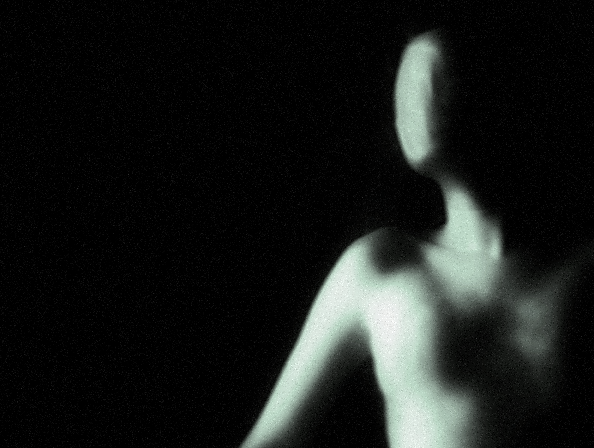 In addition, the tenant of room 307, ████ ██████, was unaccounted for among the bodies of SCP-980's "victims". Addendum 980-01: The standard SCP humanoid uniform issued to SCP-980 shortly after its recovery has remained in close proximity to SCP-980 for the entirety of its containment. The uniform showed steady results of simplification but was still serviceable until █-██-20██, when a researcher noticed that it had for the most part vanished. A thin cloud was present in SCP-980's containment cell and the composition of the cell's air was noted to contain 0.██% more hydrogen. Addendum 980-02: Lead was found to be one of few substances that is highly resistant to SCP-980's natural effects on its surroundings. As such, SCP-980's containment cell is constructed entirely of lead, with leaded glass used in its windows. In a recent test leaded glass showed increased resistance to SCP-980's effect, requiring replacement every two weeks. In the case of one D-class subject, D-980-07, physical transformation did not seem to occur. The subject spent 3 hours in the presence of SCP-980 with no abnormal experiences and was suspected immune until prompted to leave, at which point the subject wordlessly refused and continued to sit in his chair with his eyes closed. Subject responded with a silent refusal each time he was prompted until he was threatened. The subject shoved the table to the side and sprung at SCP-980, embracing it. Another threat was issued and subject began sobbing, continuing to keep his mouth and eyes shut. Subject was removed from containment cell by security after he clung to SCP-980 and attempted to claw through his own eyelids with the use of his nails. Further study of SCP-980's properties has been documented in Experiment Log 980-06.